Are you learning English or French ? Feel free to come to the conversation classes at Lare when you have time. No admission fee and no application are needed, but please make sure the day of the class before you come as we sometimes change the day. 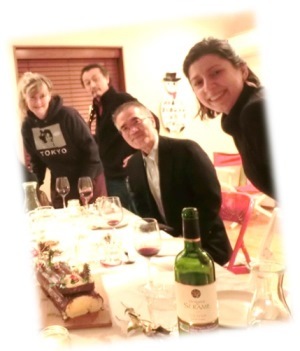 We have a small dinner party to talk French at Fanny's home in Fukazawa, Setagaya once a month. Fanny organizes a cooking school “Cocotte cuisine” and gives classes of French cuisine at several places in Tokyo. She cooks south French home style cuisine for the party. Fanny，Bix and other French guests entertain you talking all in French! Please come and enjoy the “Table d'hôte”. 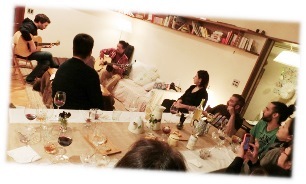 There is also a petit concert of Bix&Marki at the beginning of the party! This party would be a very good opportunity to make your French progress. Let’s play music together ! 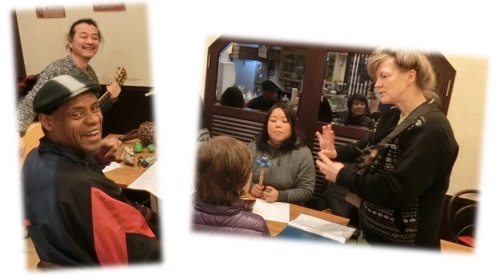 Bix&Marki organize a music “ensemble“ workshop for beginners in Café LARE, Komazawa, once a month. We work on one or two music pieces, songs that most people might know. You can bring your instrument or just sing or play a percussion that we bring. We set together the rhythm, the harmony, while playing listening to the others.. You can of course do improvisation or accompaniment. The coffee shop LARE is in Komazawa 3-chome, Setagaya, Tokyo. We ask for ¥1000 per time, for participation. Come and stretch out with Bix in the Komazawa community centre (Komazawa Chikukaikan). We also try to express our feeling or imagination with movement of the body. 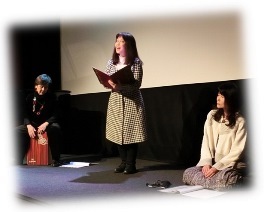 On Mondays from 2pm to 3:45pm, Fee : ¥500 for one session. Please check the schedule with Bix because she is sometimes out on a music tour. On Mondays from 3pm to 4pm, Fee : ¥500 for one session.